When a homeless man is stabbed in a Carlton park, Detective Sergeant Gemma Woodstock is the first homicide officer there. Walter Miller has no enemies, not many friends and only one witness to his murder. Gemma’s determination for justice is fierce, but she is forced to pause her pursuit when another stabbing occurs, this time of a high-profile actor. Sterling Wade has few enemies and thousands of fans, and there were hundreds of costumed witnesses to Wade’s stabbing—all of them carrying weapons. Miller’s death was lonely and Wade’s was caught on camera, but solving the two cases will test Gemma to breaking point. This is Sarah Bailey’s second novel to feature Gemma Woodstock. 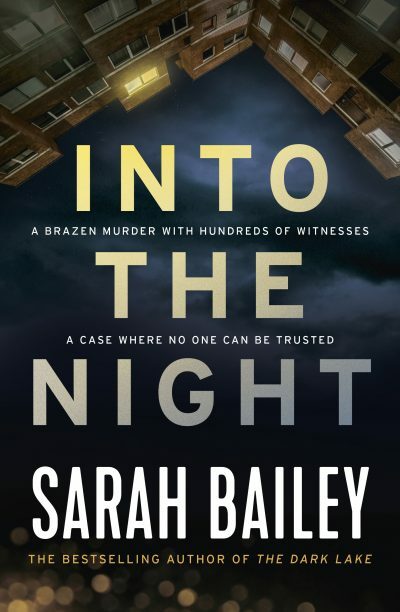 In Into the Night, Gemma has left the regional home-town setting of The Dark Lake and is using the noise of the big city and the men she beds to shake off her misery. Gemma’s transfer is a boon for the series, with Bailey’s writing stronger than ever and the prickliness of her characters a natural fit for the jarring confines of Melbourne’s central business district. For local readers, the setting itself plays a vital part, with the Melbourne streets—their bar fights and business dealings—coming to life on the page. This is a bristling police procedural for fans of Emma Viskic and J M Green.